The ‘Ariane’ name is steeped in broadcast heritage. 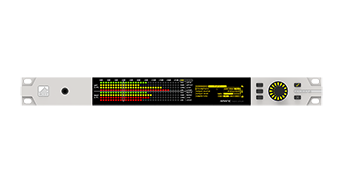 This highly regarded RMS Audio Leveler achieved cult status. Originally in analog form, decades on - those same iconic algorithms have been incorporated into our most sophisticated and feature rich platform ever. This is Ariane Encore. Using sophisticated IDR window gating technology, it knows exactly when to step in and react, working only occasionally and incredibly quickly, so unlike most other processors, with Ariane Encore you get the result without hearing the work. 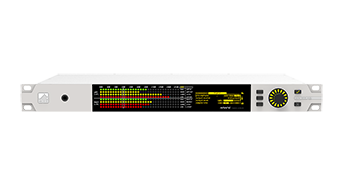 This award-winning AGC is ideal for pre-processing levels in front of your existing audio processor, your an STL, or your internet radio stream. Ariane Encore has built in flexibility with a multi-mode operation that allows the unit to be configured to your specific needs. 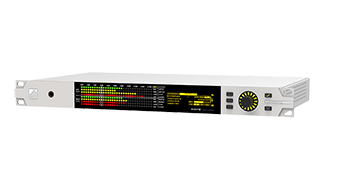 Matrix mode (sum and difference) for example, provides controllable stereo enhancement and multipath reduction for FM radio stations. With PlanB silence detection and source switching as standard, Ariane Encore can automatically revert to auxiliary sources or onboard flash memory if the signal problems arise, keeping you on-air at all times. Take complete control over each alert by mapping the event to a set of ‘do this when’ and ’do this now’ actions for the most versatile and customizable alert configuration possible. 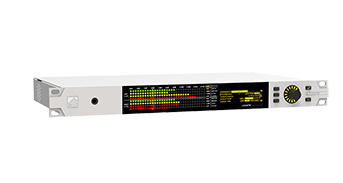 The Ariane Encore will interface easily into your existing setup with both analog and digital I/Os in the form balanced XLRs. The 3 silicone soft keys work dynamically with the display to control the most significant functions and there are instant ‘active’ and ‘bypass’ buttons to easily and instantaneously preview the processing effects.